BUILT TO LAST: Includes 2 pairs of Heavy Duty Socks Made with 100% Combed Cotton and Reinforced Elastic to Withstand Rough & Tough Usage. ROBUST DESIGN: Strengthened Core with 2-Ply Yarn Running Through Out The Socks to Increase Durability by 3 times. CUSHION COMFORT: Cotton Cushioning Beneath the Foot Provides Soft Support and Helps in Sweat Absorption and Impact Reduction. IMPORTED ELASTIC: No Worries of Slippage as The Socks Stay firmly Gripped to Your Feet Thanks to The Elastane of the Sturdiest Quality Used in Knitting. 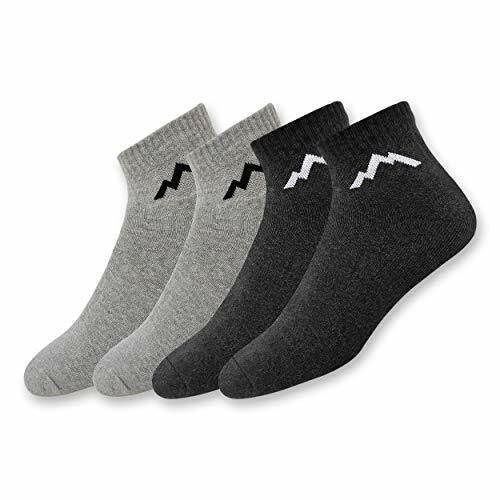 VERSATILITY: Elegant Design Combined with Superior Materials Make These Socks A Perfect Choice for All Uses from a Rigorous Trek on a Mountain to a Casual Jog Along a Beach.